Indie developer 2Awesome Studio has announced that the isometric puzzler, Back to Bed is releasing for Nintendo Switch on April 11th. 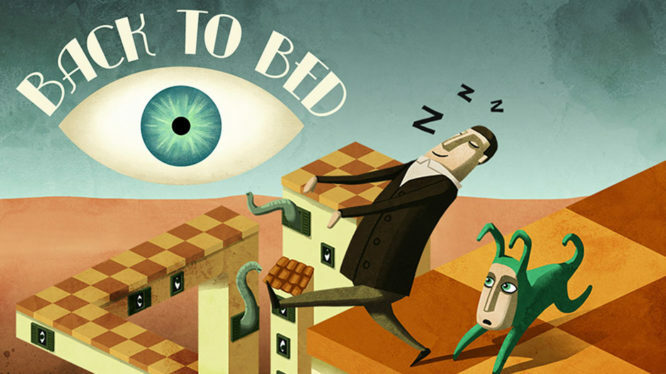 In Back to Bed, you control the subconscious of a dreaming sleepwalker named Bob as he walks endlessly and aimlessly through each level. Tasked with guiding him through surreal landscapes and protecting him from danger is the manifestation of his subconscious, Subob. You (as Subob) must pick up and move objects to change Bob’s trajectory before he falls off the edge of the world or walks into danger. Not every level is quite that simple but each share the same goal – get Bob safely to bed. Level design inspired by M.C. Escher’s famous artwork. Back to Bed’s dream world has a surreal art style heavily inspired by the work of Salvador Dali, with level design inspired by M.C. Escher. You’ll encounter melting and moving clocks, move strange everyday objects, teleport through bizarre mirrors, and walk up walls or across impossible walkways. If you’ve ever played games like Monument Valley or Echochrome, you’ll be familiar with this kind of concept. Originally developed by Bedtime Digital and released on PC in 2014, Back to Bed launches on the Nintendo eShop on April 11th for £4.99 / €4,99 / $4.99. If you’re itching to get your brain around the game’s puzzles, you can pre-order the game from 28th of March for a 10% discount.